Abstract: Lithium is used primarily as a mood stabilizer for bipolar disorder and has been used to treat mania, depression and suicidal thoughts for a long time. In addition, it has also been shown to prevent cognitive decline which indicated that lithium has a potential therapeutic effect in Alzheimer’s disease (AD). However, one of the main problems that exist in the currently FDA-approved lithium pharmaceutics (carbonate and citrate) is that it has narrow therapeutic index and lithium plasma level change drastically which can cause adverse side effects. Here we investigated the safety, pharmacokinetics and therapeutic efficacies of LISPRO (ionic co-crystals of lithium salicylate with organic l-proline), lithium salicylate, Li2CO3 (currently used) and placebo. We found that LISPRO attenuate β-amyloid plaques and phosphorylation of tau through modulation of inflammation and GSK3β inactivation. Cytokine profiles in the brain, plasma and splenocyte suggest that LISPRO (8-weeks) down-regulates pro-inflammatory, up-regulates anti-inflammatory and suppresses renal COX2 expression in Tg2576 mice. Plasma and brain pharmacokinetics of lithium indicated that LISPRO showed significantly higher brain and steady plasma lithium levels on C57BL/6J (2-weeks) and Tg2576 (8-weeks) mice. 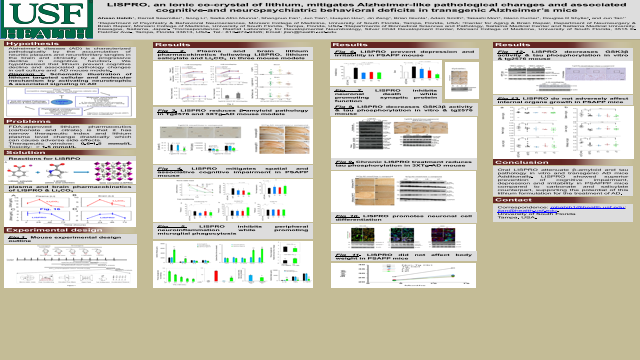 Interestingly, chronic (20-weeks) administration of LISPRO produces a slightly higher, but non-significant brain to plasma lithium levels and reduces β-amyloid plaques, and tau-phosphorylation through modulation of presynaptic (synaptophysin) and post-synaptic protein (PSD95) expression in 3xTg-AD mice. Moreover, Female AβPPSWE/PS1dE9 mice at 4 months of age were orally treated with LP, LS or LC for 9 months at 2.25 mmol lithium/kg/day followed by determination of body weight, growth of internal organs and cognitive and non-cognitive behavior. Untreated age-matched non-transgenic mice (B6C3F1/J) served as controls. Comparison between groups was performed by ANOVA followed by post hoc Fisher’s least significance difference (LSD) multiple comparison analyses. No significant differences in growth of body weight, brain, heart, lung, spleen, liver or kidney were found between lithium treated- and untreated cohorts. LP treatment produced superior improvement of cognitive function compared with untreated AβPPSWE/PS1dE9 mice, as shown by lower escape latency during training and probe trial of the Morris water maze (MWM) test and longer contextual freezing time during the fear conditioning test. LP treatment also reduced depression, as assessed by tail suspension test, and irritability, as assessed by touch escape test. However, lithium treatment did not alter anxiety or locomotor activity as assessed by open field, elevated plus maze or accelerated rotarod tests. Summary: Oral LISPRO attenuate β-amyloid and tau pathology in vitro and transgenic AD mice Additionally, LISPRO showed superior prevention of cognitive impairment, depression and irritability in PSAPPP mice compared to carbonate and salicylate counterpart, supporting the potential of this lithium formulation for the treatment of AD. 1. Smith AJ, Kim SH, Duggirala NK, Jin J, Wojtas L, Ehrhart J, Giunta B, Tan J, Zaworotko MJ, Shytle RD (2013) Improving lithium therapeutics by crystal engineering of novel ionic cocrystals. Molecular pharmaceutics 10:4728-4738. 2. Smith AJ, Kim SH, Tan J, Sneed KB, Sanberg PR, Borlongan CV, Shytle RD (2014) Plasma and Brain Pharmacokinetics of Previously Unexplored Lithium Salts. RSC advances 4:12362-12365. 3. Forlenza OV, De-Paula VJ, Diniz BS (2014) Neuroprotective effects of lithium: implications for the treatment of Alzheimer's disease and related neurodegenerative disorders. ACS chemical neuroscience 5:443-450.